Raging waters causes lots of damages that cannot be avoided. Up to now, in recent posts we have focused on the process of drainage formation and evolution and on the variety of landscape features formed by streams. Now we turn our attention to the havoc that a stream can cause when ﬂooding takes place. Floods can be catastrophic they can strip land of forests and buildings, they can bury land in clay and silt, and they can submerge cities. A ﬂood occurs when the volume of water ﬂowing down a stream exceeds the volume of the stream channel, so water rises out of the channel and spreads out over a ﬂoodplain or delta plain, or ﬁlls a canyon to a greater depth than normal. when a dam holding back a lake or reservoir, or a levee or retaining wall holding back a river or canal, suddenly collapses and releases the water that it held back. 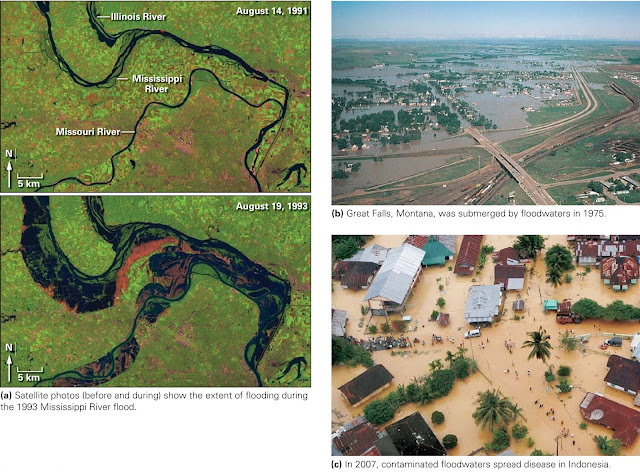 Examples of seasonal floodplain flooding. Geologists ﬁnd it convenient to divide ﬂoods into two general categories. Floods that occur during a “wet season,” when rainfall is heavy or when winter snows start to melt, are called seasonal ﬂoods. Floods of this type typically take place in tropical regions during monsoons, and in temperate regions during the spring when storms drench the land frequently and or a heavy winter snow pack melts. 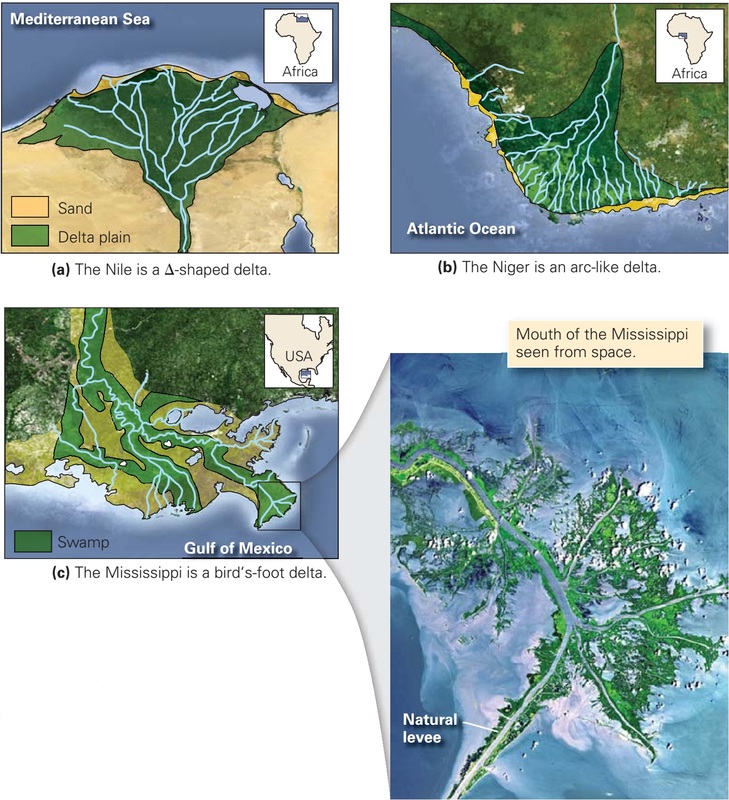 When seasonal ﬂoods submerge ﬂoodplains, they produce ﬂoodplain ﬂoods, and when they submerge delta plains they produce delta-plain ﬂoods (figure above a–c). Flash floods can occur after torrential rains. Events during which the ﬂood waters rise so fast that it may be impossible to escape from the path of the water are called ﬂash ﬂoods (figure above a, b). These happen during unusually intense rainfall or as a result of a dam collapse (as in the 1889 Johnstown ﬂood) or levee failure. During a ﬂash ﬂood, a canyon or valley may ﬁll to a level many meters above normal. In some cases, a wall of water may slam downstream with great force, leaving devastation in its wake, but the flood waters subside after a short time. Flash ﬂoods can be particularly unexpected in arid or semiarid climates, where isolated thundershowers may suddenly ﬁll the channel of an otherwise dry wash, whose unvegetated ground allows runoff to reach the channel faster. Such a ﬂood may even affect areas downstream that had not received a drop of rain. In the spring of 1993, the jet stream, the high-altitude (10–15 km high) wind current that strongly affects weather systems, drifted southward. For weeks, the jet stream’s cool, dry air formed an invisible wall that trapped warm, moist air from the Gulf of Mexico over the central United States. When this air rose to higher elevations, it cooled, and the water it held condensed and fell as rain, rain, and more rain. In fact, almost a whole year’s supply of rain fell in just that spring some regions received 400% more than usual. Because the rain fell over such a short period, the ground became saturated and could no longer absorb additional water, so the excess entered the region’s streams, which carried it into the Missouri and Mississippi rivers. Eventually, the water in these rivers rose above the height of levees or broke through levees, and spread out over the ﬂoodplain. By July, parts of nine states were underwater (see a in first figure). The roiling, muddy ﬂood uprooted trees, cars, and even cofﬁns (which ﬂoated up from inundated graveyards). All barge trafﬁc along the Mississippi came to a halt, bridges and roads were undermined and washed away, and towns along the river were submerged. For example, in Davenport, Iowa, the river front district and baseball stadium were covered with 4 m (14 ft) of water. In Des Moines, Iowa, 250,000 residents lost their supply of drinking water when ﬂood waters contaminated the municipal water supply with raw sewage and chemical fertilizers. Row boats replaced cars as the favoured mode of transportation in towns where only the rooftops remained visible. In St. Louis, Missouri, the river crested 14 m (47 ft) above ﬂood stage. For 79 days, the ﬂooding continued. When the water ﬁnally subsided, it left behind a thick layer of sediment, ﬁlling living rooms and kitchens in ﬂoodplain towns and burying crops in ﬂoodplain ﬁelds. In the end, more than 40,000 square km of the ﬂoodplain had been submerged, 50 people died, at least 55,000 homes were destroyed, and countless acres of crops were buried. Ofﬁcials estimated that the ﬂood caused over $12 billion in damage. Comparable ﬂooding happened again in the spring of 2011, in the Mississippi and Missouri drainage basins. On a typical sunny day in the Front Range of the Rocky Mountains, north of Denver, Colorado, the Big Thompson River seems quite harmless. Clear water, dripping from melting ice and snow higher in the mountains, ﬂows down its course through a narrow canyon, frothing over and around boulders. In places, vacation cabins, camp grounds, and motels line the river. The landscape seems immutable, but as is the case with so many geologic features, permanence is an illusion. On July 31, 1976, easterly winds blew warm, moist air from the Great Plains toward the Rocky Mountain front. As this air rose over the mountains, towering thunder heads built up, and at 7:00 P.M. rain began to fall. It poured, in quantities that even old-timers couldn't recall. In a little over an hour, 19 cm (7.5 inches) of rain drenched the watershed of the Big Thompson River. The river’s discharge grew to more than four times the maximum recorded at any time during the previous century. The river rose quickly, in places reaching depths several meters above normal. Turbulent water swirled down the canyon at up to 8 m per second and churned up so much sand and mud that it became a viscous slurry. Slides of rock and soil tumbled down the steep slopes bordering the river and fed the torrent with even more sediment. The water undercut house foundations and washed the houses away, along with their inhabitants (see above figure b). Roads and bridges disappeared, and boulders that had stood like landmarks for generations bounced along in the torrent like beach balls, striking and shattering other rocks along the way. Cars drifted downstream until they ﬁnally wrapped like foil around obstacles. 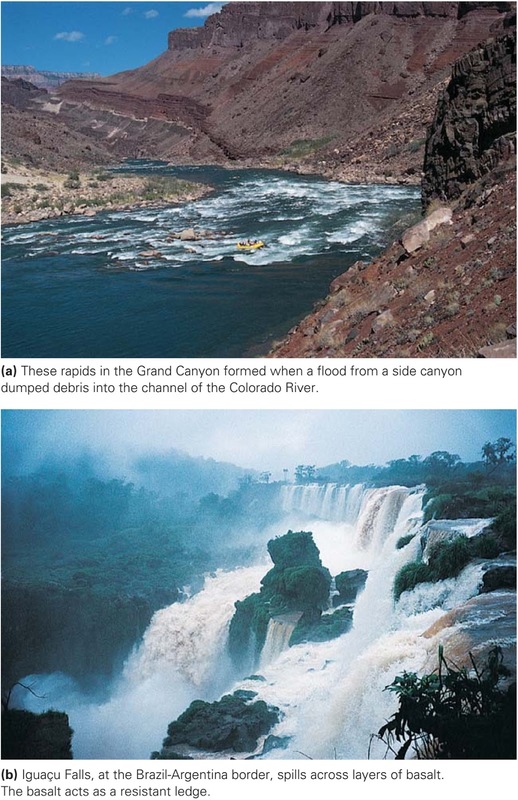 When the ﬂood subsided, the canyon had changed forever, and 144 people had lost their lives. Holding back rivers to prevent floods. Mark Twain once wrote of the Mississippi that we “cannot tame that lawless stream, cannot curb it or conﬁne it, cannot say to it, ‘go here or go there,’ and make it obey.” Was Twain right? Since ancient times, people have attempted to control courses of rivers so as to prevent undesired ﬂooding. In the 20th century, ﬂood-control efforts intensiﬁed as the population living along rivers increased. For example, since the passage of the 1927 Mississippi River Flood Control Act (drafted after a disastrous ﬂood took place that year), the U.S. Army Corps of Engineers has laboured to control the Mississippi. First, engineers built about 300 dams along the river’s tributaries so that excess run-off could be stored in the reservoirs and later be released slowly. Second, they built artiﬁcial levees of sand and mud, and built concrete ﬂood walls to increase the channel’s volume. Artiﬁcial levees and ﬂood walls isolate a discrete area of the ﬂoodplain (figure above a–c). Although the Corps’ strategy worked for ﬂoods up to a certain size, it was insufﬁcient to handle the 1993 and 2011 ﬂoods when reservoirs ﬁlled to capacity, and additional run-off headed downstream. The river rose until it spilled over the tops of some levees and undermined others. “Undermining” occurs when rising water levels increase the water pressure on the river side of the levee, forcing water through sand under the levee. In susceptible areas, water begins to spurt out of the ground on the dry side of the levee, thereby washing away the levee’s support. The levee ﬁnally becomes so weak that it collapses, and water ﬁlls in the area behind it. In some cases, the Corps of Engineers intentionally dynamites levees along a relatively unpopulated reach of the river upstream of a vulnerable town. This diverts water out onto a portion of the ﬂoodplain where the water will do less damage, and prevents the flood waters from over topping levees close to the town. Another solution to ﬂooding in some localities may involve restoration of wetland areas along rivers, for wetlands can absorb signiﬁcant quantities of ﬂood water. Also, where appropriate, planners may prohibit construction within designated land areas adjacent to the channel, so that ﬂood water can ﬁll these areas without causing expensive damage. 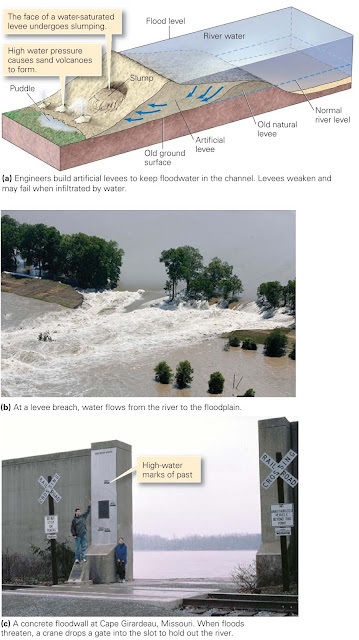 The existence of such areas, which are known as ﬂood ways, effectively increases the volume of water that the river can carry and thus helps prevent the water level from rising too high. For example, the annual probability of a 50-year ﬂood is 1/50, which can also be written as 0.02 or 2%. Unfortunately, some people are misled by the meaning of recurrence interval, and think that they do not face future ﬂooding hazard if they buy a home within an area just after a 100-year ﬂood has occurred. Their conﬁdence comes from making the incorrect assumption that because such ﬂooding just happened, it can’t happen again until “long after I'm gone.” They may regret their decision because two 100-year ﬂoods can occur in consecutive years or even in the same year (alternatively, the interval between such ﬂoods could be, say, 210 years). 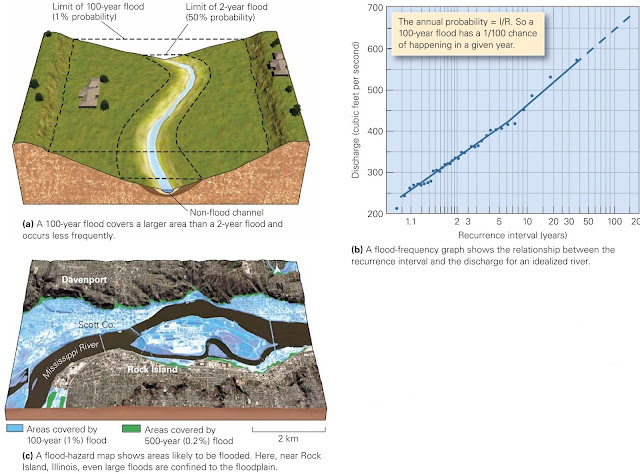 The conceptual relationship between flood size and probability. The recurrence interval for a ﬂood along a particular river reﬂects the size of a ﬂood. For example, the discharge of a 100-year ﬂood is larger than that of a 2-year ﬂood, because the 100-year event happens less frequently (figure above a). To deﬁne this relationship, geologists construct graphs that plot ﬂood discharge on the vertical axis against recurrence interval on the horizontal axis (figure above b). Knowing the discharge during a ﬂood of a speciﬁed annual probability, and knowing the shape of the river channel and the elevation of the land bordering the river, hydrologists can predict the extent of land that will be submerged by such a ﬂood. Such data, in turn, permit hydrologists to produce ﬂood-hazard maps. In the United States, the Federal Emergency Management Agency (FEMA) produces maps that show the 1% annual probability (100-year) ﬂood area and the 0.2% annual probability (500-year) ﬂood risk zones (figure above c). Fluvial landscapes evolve over time. Though the above model makes intuitive sense, it is an oversimpliﬁcation. Plate tectonics can uplift the land again, and/or global sea-level rise or fall can change the base level, so in reality peneplains rarely develop before downcutting begins again. Stream rejuvenation occurs when a stream starts to downcut into a land surface whose elevation lies near the stream’s base level. 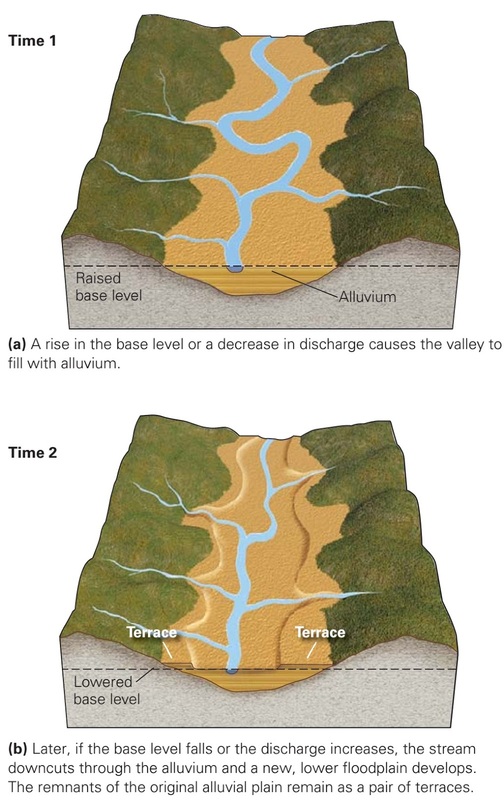 Rejuvenation can be triggered by several phenomena, such as: a drop in base level, as happens when sea level falls; an uplift event that causes the land to rise relative to the base level; or an increase in stream discharge that makes the stream more able to erode and transport sediment. As we've seen, rejuvenation can lead to formation of stream terraces in alluvium. In cases where rejuvenation causes a stream to erode deeply into the land, a new canyon or valley will develop. 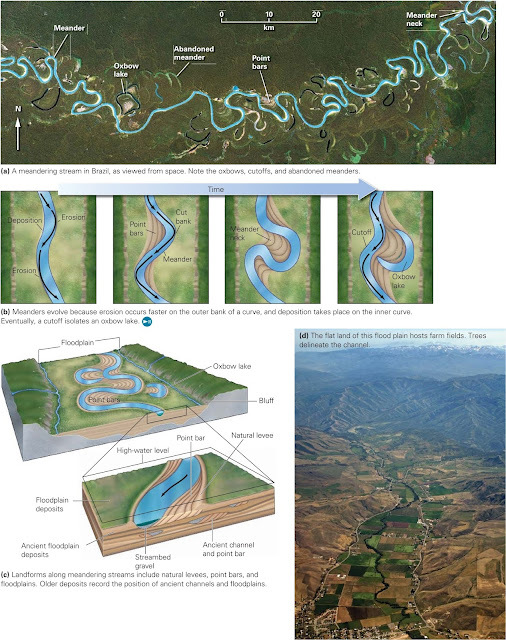 If the rejuvenated stream had a meandering course, downcutting produces incised meanders (figure above b). Stream piracy sounds like pretty violent stuff. In reality, it’s just a natural process that happens when headward erosion by one stream causes the stream to intersect the course of another stream. When this happens, the pirate stream “captures” the water of the stream that it has intersected, so that the water of the captured stream starts to ﬂow down the pirate stream. Because of piracy, the channel of the captured stream, downstream of the point of capture, dries up (figure above a, b). In some cases, stream capture changes a “water gap” (a stream carved notch through a ridge) into a dry “wind gap.” In 1775, Daniel Boone, the legendary pioneer, led settlers through the Cumberland Gap, a wind gap in the Appalachians, to new homesteads in western Kentucky. The pattern of stream ﬂow in an area can also be altered, over time, on a continental scale. For example, when South America and Africa were adjacent to each other in Pangaea, a highland existed along the boundary between the two continents, and the main drainage network of northern South America ﬂowed westward. Later, when South America rifted away from Africa, a convergent plate boundary developed along the western margin of South America, causing the Andes Mountains to rise. The uplift of the Andes caused a drainage reversal, in that the overall slope direction of the drainage network became the opposite of what it once had been. As a consequence, westward ﬂow became impossible, and the eastward-ﬂowing Amazon drainage network developed. Superposed streams: Imagine a region in which streams start to flow over horizontal beds of strata that unconformably overlie folded strata. When the streams eventually erode down through the unconformity and start to downcut into the folded strata, they maintain their earlier course, ignoring the structure of the folded strata. Geologists call such streams superposed streams, because their pre-existing geometry has been laid down on underlying rock structure (figure above a, b). 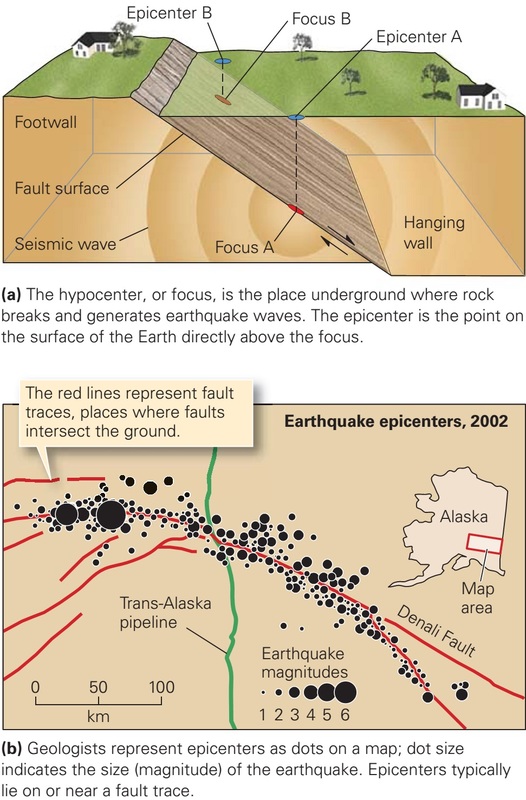 Antecedent streams: In some cases, tectonic activity (such as subduction or collision) causes a mountain range to rise up beneath an already established stream. If the stream downcuts as fast as the range rises, it can maintain its course and will cut right across the range. Geologists call such streams antecedent streams (from the Greek ante, meaning before) to emphasize that they existed before the range uplifted. Note that if the range rises faster than the stream downcuts, the new highlands divert (change) the stream’s course so that it flows parallel to the range face (figure below a–c). Development of antecedent and diverted streams. Scouring: Running water can remove loose fragments of sediment, a process called scouring. Breaking and lifting: In some cases, the push of flowing water can break chunks of solid rock off the channel floor or walls. 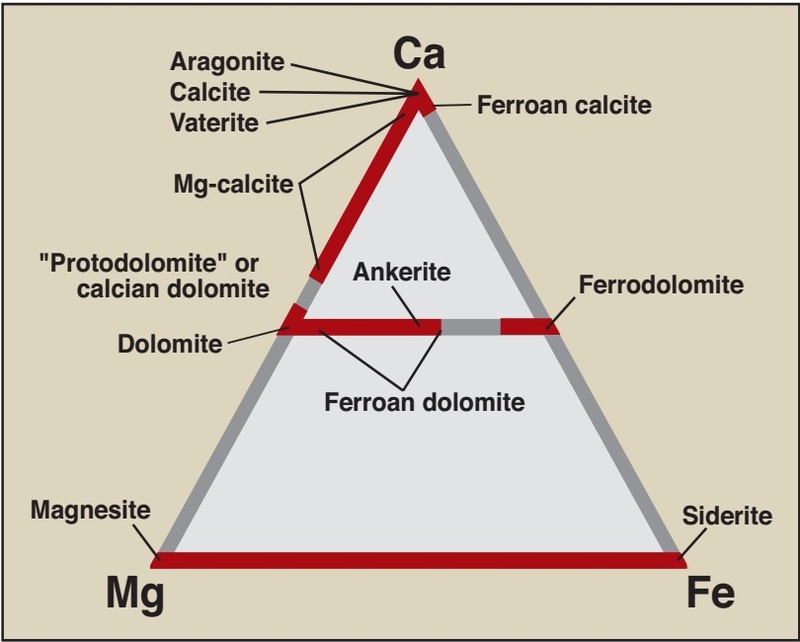 In addition, the flow of a current over a clast can cause the clast to rise, or lift off the substrate. Abrasion: Clean water has little erosive effect, but sedimentladen water acts like sandpaper and grinds or rasps away at the channel floor and walls, a process called abrasion. 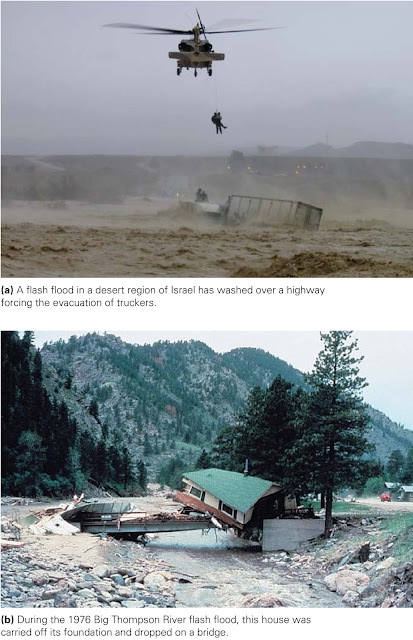 In places where turbulence produces long-lived whirlpools, abrasion by sand or gravel carves a bowl-shaped depression, called a pothole, into the floor of the stream (figure below a, b). Dissolution: Running water dissolves soluble minerals as it passes, and carries the minerals away in solution. 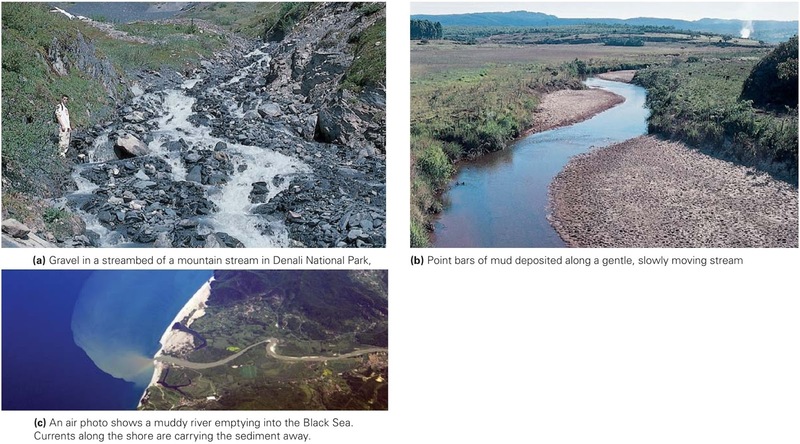 Erosion and transportation in streams. The efﬁciency of erosion depends on the velocity and volume of water and on its sediment content. A large volume of fast moving, turbulent, sandy water causes more erosion than does a trickle of quiet, clear water. Thus, most erosion takes place during ﬂoods, when a stream carries a large volume of fast moving, sediment-laden water. 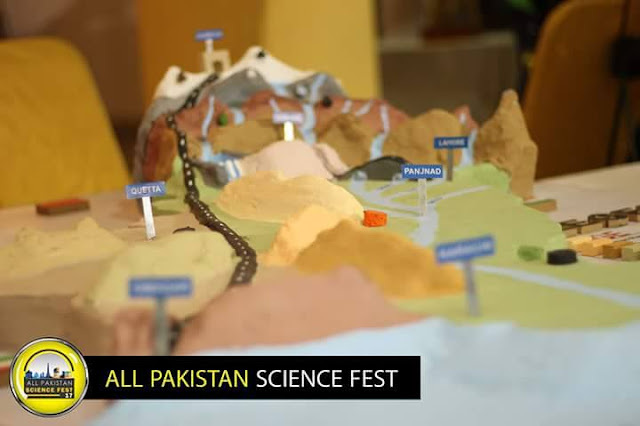 How Do Streams Transport Sediment? Dissolved load: Running water dissolves soluble minerals in the sediment or rock that it flows over, and groundwater seeping into a stream brings dissolved minerals with it. The ions of these dissolved minerals constitute a stream’s dissolved load. Suspended load: The suspended load of a stream usually consists of tiny solid grains (silt or clay size) that swirl along with the water without settling to the floor of the channel. Bed load: The bed load of a stream consists of large particles (such as sand, pebbles, or cobbles) that bounce or roll along the stream floor. Bed-load movement commonly involves saltation. During saltation, a multitude of grains bounce along in the direction of flow, within a zone that extends up from the surface of the stream bed for a distance of several centimetres to several tens of centimetres. Each saltating grain in this zone follows a curved trajectory up through the water and then back down to the bed. When it strikes the bed, it knocks other grains upward, and thus supplies grains to the saltation zone. When describing a stream’s ability to carry sediment, geologists specify its competence and capacity. The competence of a stream refers to the maximum particle size it carries; a stream with high competence can carry large particles, whereas one with low competence can carry only small particles. Competence depends on water velocity. Thus, a fast-moving, turbulent stream has greater competence (it can carry bigger particles) than a slow-moving stream, and a stream in ﬂood has greater competence than a stream with normal ﬂow. In fact, the huge boulders that litter the bed of a mountain creek move only during ﬂoods. The capacity of a stream refers to the total quantity of sediment it can carry. A stream’s capacity depends on its competence and discharge. So a large river has more capacity than a small creek. A raging torrent of water can carry coarse and ﬁne sediment the ﬁner clasts rush along with the water as suspended load, whereas the coarser clasts may bounce and tumble as bed load. 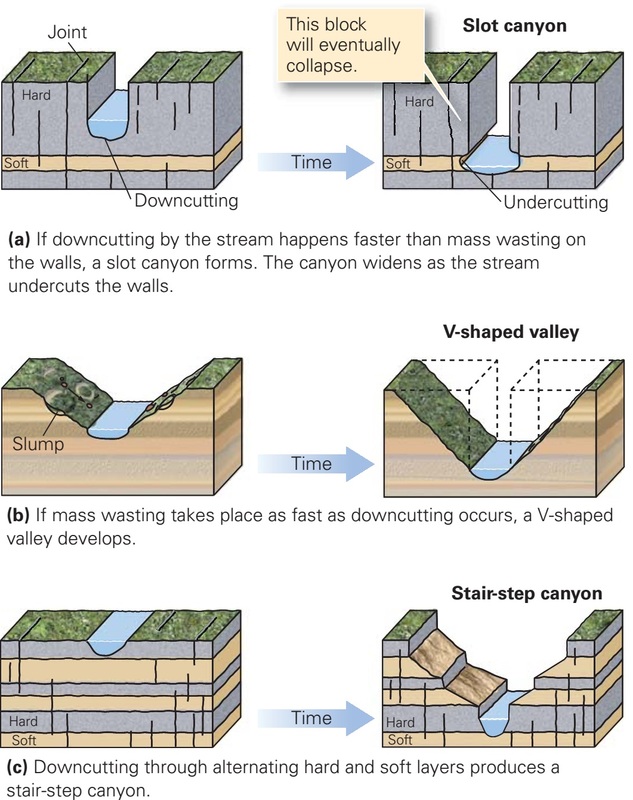 If the ﬂow velocity decreases, either because the slope of the stream bed becomes shallower or because the channel broadens out and friction between the bed and the water increases, then the competence of the stream decreases and sediment settles out. The size of the clasts that settle at a particular locality depends on the decrease in ﬂow velocity at the locality. For example, if the stream slows by a small amount, only large clasts settle; if the stream slows by a greater amount, medium-sized clasts settle; and if the stream slows almost to a standstill, the ﬁne grains settle. Because of this process of sediment sorting, stream deposits tend to be segregated by size gravel accumulates in one location and mud in another. Sediments, carried and deposited by streams. The clast size depends upon the stream velocity. Geologists refer to sediments transported by a stream as ﬂuvial deposits (from the Latin ﬂuvius, meaning river) or alluvium. Fluvial deposits may accumulate along the stream bed in elongate mounds, called bars (figure above a, b). In cases where the stream channel makes a broad curve, water slows along the inner edge of a curve, so a crescent-shaped point bar bordering the shoreline of the inner curve develops. During ﬂoods, a stream may over-top the banks of its channel and spread out over its ﬂoodplain, a broad ﬂat area bordering the stream. Friction slows the water on the ﬂoodplain, so a sheet of silt and mud settles out to comprise ﬂoodplain deposits. Where a stream empties at its mouth into a standing body of water, the water slows and a wedge of sediment, called a delta, accumulates (figure above c). Water that drains the land has a series of streams network which is filled from either the ground water or the water from the atmosphere, hydrologic cycle. Excess surface water (runoff) comes from rain, melting ice or snow, and ground water springs. On flat round, water accumulates in puddles ow swamps, but no slopes, it flows downslope in streams. Where does the water in a stream come from? Recall that water enters the hydrologic cycle by evaporating from the Earth’s surface and rising into the atmosphere. After a relatively short residence time, atmospheric water condenses and falls back to the Earth’s surface as rain or snow that accumulates in various reservoirs. Some rain or snow remains on the land as surface water (in puddles, swamps, lakes, snowﬁelds, and glaciers), some ﬂows downslope as a thin ﬁlm called sheetwash, and some sinks into the ground, where it either becomes trapped in soil (as soil moisture) or descends below the water table to become groundwater. (the water table is the level below which groundwater ﬁlls all the pores and cracks in subsurface rock or sediment. Above the water table, air partially or entirely ﬁlls the pores and cracks.) Streams can receive input of water from all of these reservoirs (figure above). Speciﬁcally, gravity pulls surface water (including meltwater) downhill into stream channels, the pressure exerted by the weight of new rainfall squeezes existing soil moisture back out of the ground, and groundwater seeps out of the channel walls into the channel, if the ﬂoor of the channel lies below the water table. Running water collects in stream channels, because a channel is lower than the surrounding area and gravity always moves material from higher to lower elevation. How does a stream channel form in the ﬁrst place? The process of channel formation begins when sheetwash starts ﬂowing downslope. Like any ﬂowing ﬂuid, sheetwash erodes its substrate (the material it ﬂows over). The efﬁciency of such erosion depends on the velocity of the ﬂow faster ﬂows erode more rapidly. In nature, the ground is not perfectly planar, not all substrate has the same resistance to erosion, and the amount of vegetation that covers and protects the ground varies with location. Thus, the velocity of sheetwash also varies with location. Where the ﬂow happens to be a bit faster, or the substrate is a little weaker, erosion scours (digs) a channel. Since the channel is lower than the surrounding ground, sheetwash in adjacent areas starts to head toward it. With time, the extra ﬂow deepens the channel relative to its surroundings, a process called downcutting, and a stream forms. 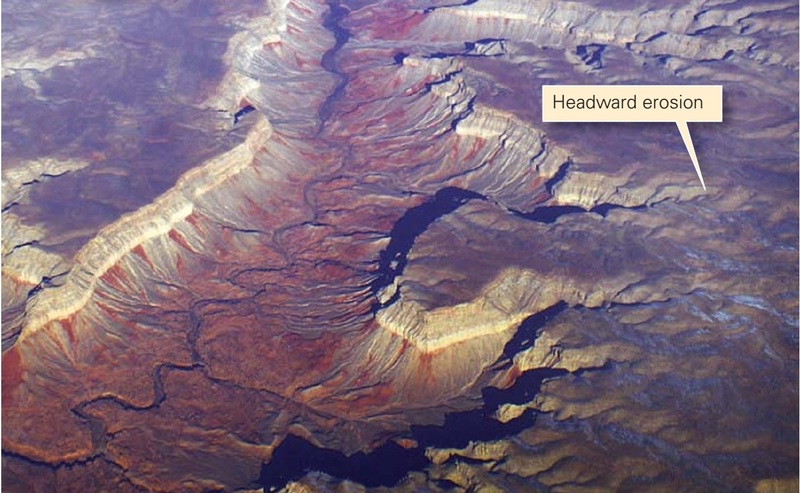 An example of headward erosion. The main stream ﬂows in a deep valley. Side streams are cutting into the bordering plateau. As its ﬂow increases, a stream channel begins to lengthen at its origin, a process called headward erosion (figure above). Headward erosion occurs for two reasons. First, it happens when the surface ﬂow converging at the entrance to a channel has sufﬁcient erosive power to downcut. Second, it happens at locations where groundwater seeps out of the ground and enters the entrance to the stream channel. Such seepage, called “groundwater sapping,” gradually weakens and undermines the soil or rock just upstream of the channel’s endpoint until the material collapses into the channel; the collapsed debris eventually washes away during a ﬂood. Each increment of collapse makes the channel longer. As downcutting deepens the main channel, the surrounding land surfaces start to slope toward the channel. Thus, new side channels, or tributaries, begin to form, and these ﬂow into the main channel. Eventually, an array of linked streams evolves, with the smaller tributaries ﬂowing into a trunk stream. The array of interconnecting streams together constitute the drainage network. Like transportation networks of roads, drainage networks of streams reach into all corners of a region, providing conduits for the removal of runoff. 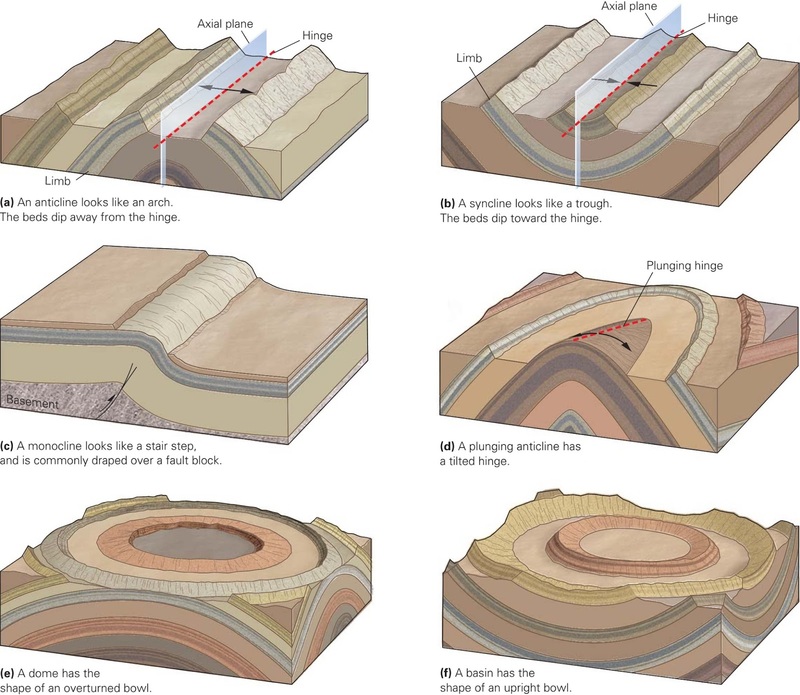 Block diagrams illustrating five types of drainage networks. The conﬁguration of tributaries and trunk streams deﬁnes the map pattern of a drainage network. This pattern depends on the shape of the landscape and the composition of the substrate. Geologists recognize several types of networks on the basis of the network’s map pattern (figure above). Dendritic: When rivers flow over a fairly uniform substrate with a fairly uniform initial slope, they develop a dendritic network, which looks like the pattern of branches connecting to the trunk of a deciduous tree. Radial: Drainage networks forming on the surface of a cone shaped mountain flow outward from the mountain peak, like spokes on a wheel. Such a pattern defines a radial network. Rectangular: In places where a rectangular grid of fractures (vertical joints) breaks up the ground, channels form along the preexisting fractures, and streams join each other at right angles, creating a rectangular network. Trellis: In places where a drainage network develops across a landscape of parallel valleys and ridges, major tributaries flow down a valley and join a trunk stream that cuts across the ridges. The resulting map pattern resembles a garden trellis, so the arrangement of streams constitutes a trellis network. Parallel: On a uniform slope, several streams with parallel courses develop simultaneously. The group comprises a parallel network. A drainage network collects water from a broad region, variously called a drainage basin, catchment, or watershed, and feeds it into the trunk stream, which carries the water away. The highland, or ridge, that separates one watershed from another is a drainage divide (figure above a, b). A continental divide separates drainage that ﬂows into one ocean from drainage that ﬂows into another. For example, if you straddle the continental divide where it runs along the crest of the Rocky Mountains in the western United States, and pour a cup of water out of each hand, the water in one hand ﬂows to the Atlantic, and the water in the other ﬂows to the Paciﬁc. Three divides bound part of the Mississippi drainage basin, which drains the interior of the United States. The contact between permanent and ephemeral streams. Permanent streams ﬂow all year long, whereas ephemeral streams ﬂow only for part of the year. Some ephemeral streams ﬂow only for tens of minutes to a few hours, following a heavy rain. Most permanent streams exist where the ﬂoor (or bed) of the stream channel lies below the water table (figure above a). In these streams, which occur in humid or temperate climates, water comes not only from upstream or from surface runoff, but also from springs through which groundwater seeps. If the bed of a stream lies above the water table, then the stream can be permanent only when the rate at which water arrives from upstream exceeds the rate at which water inﬁltrates into the ground below. For example, the downstream portion of the Colorado River in the dry Sonoran Desert of Arizona ﬂows all year, because enough water enters it from the river’s wet headwaters upstream in Colorado; hardly any water enters the stream from the desert itself. 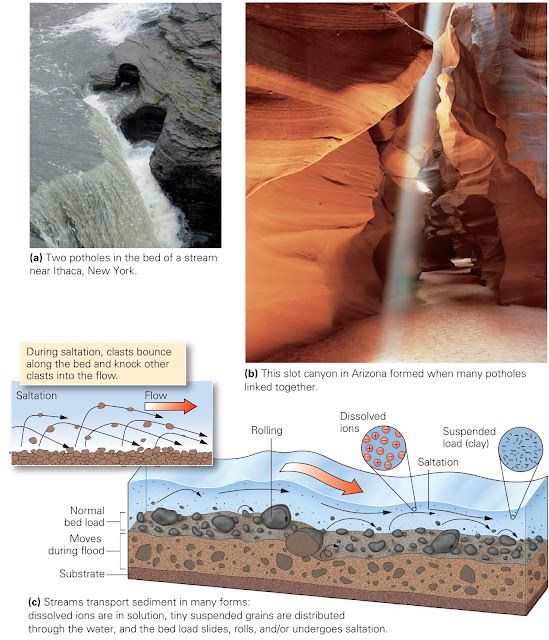 Streams that do not have a sufﬁcient upstream source, and whose beds lie above the water table, are ephemeral, because the water that ﬁlls a channel due to a heavy rain or a spring thaw eventually sinks into the ground and/or evaporates, and the stream dries up (figure above b). Streams whose watersheds lie entirely within an arid region tend to be ephemeral. The dry bed of an ephemeral stream is variously called a dry wash, an arroyo, or a wadi.